When we first set eyes on the Celebrity Equinox Cruise Ship, the only words I could think to say were, “Holy crap! This ship is freaking huge.” It was like a small city floating on water. The adults had all traveled by cruise ship before, but this was by far the largest ship any of us had been on. How the heck do they do that? This was a question I would repeatedly ask myself regarding many of the sights and structures we saw that were so colossal or intricate that I could not imagine what it would have taken to construct them. Whether we were looking at the cruise ship, a Roman temple, or a meticulously carved statue, the creation of it baffled me. The kids were in shock and mesmerized by the gargantuan boat. I refused to get any further bogged down with worries because, like with flying, the more I thought about it, the more twisted my thoughts became. Once officially on board and in our cabin, I was pleasantly surprised by the size of our quarters. Our suite was quite spacious. It had a master bedroom, a bunk bed compartment for the girls, a comfortable sitting area with a couch, two chairs and a television, a dining table, a small veranda, and of course, a bathroom. Wow—all of Tony’s planning sure paid off. The last time Tony and I cruised, we were on our honeymoon. Our cabin was so small that our bed barely fit. We had to squeeze and maneuver our way around the bed to get to the door and to gain access to the bathroom. Tony said it made him feel claustrophobic. I remember thinking he looked like a bear in a bird’s nest. Apparently, some things get better with age. Finally getting settled into our cabin was a nice turning point as we prepared for the next phase of the trip. This would be our home for the next twelve days, and we were spending our first full day aboard at sea. All I could think about was doing a whole lot of nothing. 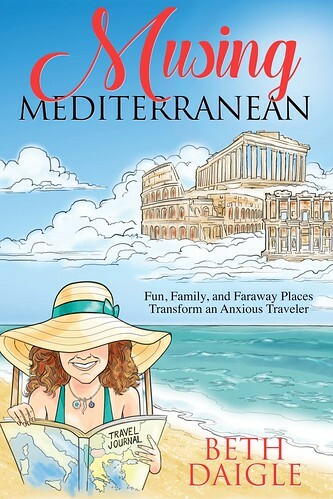 This is an excerpt from Daigle's new book, Musing Mediterranean: Fun, Family, and Faraway Places Transform an Anxious Traveler. Whether it's a fear of turbulence, the possibility of a crash, or just the experience of getting in a metal tube with 100 fellow passengers, a lot of people are afraid to fly. Beth Daigle, a longtime freelance writer and blogger is one of those people. On top of that, she suffers from anxiety about the whole process of travel, and in fact, would almost always rather stay at home. When her husband suggested a two-week trip to her ancestral homes of Greece, Italy, and Turkey, Daigle was equal parts terrified and drawn to the idea. To add to her panic, nine of her relatives would be joining them on this trip. What followed turned out to be the trip of a lifetime. Daigle and her family made their way through Rome, Sicily, Athens, Ephesus, the Greek Islands, and Naples. And though they had some humorous bumps along the way, she was irrevocably altered by the culture, character, and beauty of each place. "I learned the value and importance of travel on this trip," says Daigle. "I want people to know that even if they suffer from anxiety, they can have a positive mindset that allows them to travel with an open mind. To take the good with the bad and not get caught up in what might go wrong, but revel in everything that is going right."